My recipe is not really a recipe. It started out as one (actually, it was a Weight Watchers recipe), but I have tweaked it over time and now I just kind of “throw it together” from memory. My family goes nuts for these and are so used to them they long ago stopped asking me for beef meatballs (good thing, because I haven't been able to hold down hamburger since I was pregnant with my first child!). I usually double or triple this recipe and freeze the extras. about 1 cup rolled oats, put in the food processor to make them in to “breadcrumbs” (I have also done half oatmeal, half Fiber One cereal) You can also use commercial breadcrumbs or I also save the ends of loaves of bread in the freezer to make homemade breadcrumbs. Combine everything in a bowl, mixing just to combine. Don't overmix! Add more “oatcrumbs”/breadcrumbs if needed. You want the meatballs to hold their shape, but not be too dry. Spray a baking sheet with non-stick spray. Form the meatballs so that they are about the size of a golf ball. Place on cookie sheet. Remove from oven and remove from cookie sheet immediately to prevent sticking. This sauce is great for meatball sandwiches or even serving the meatballs as “cocktail meatballs”. It's a little sweet to have over pasta, although I have been known to do it! I usually make extra sauce because my husband likes it for dipping bread as well. 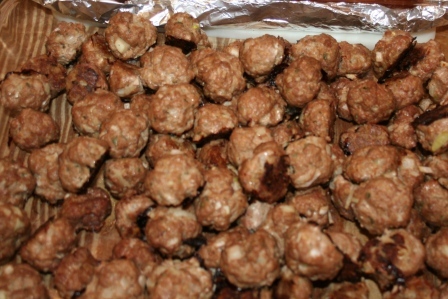 As soon as you put the meatballs in the oven, mix the sauce together in a pan large enough to hold the meatballs. Heat over a slow heat. When the meatballs are done, put them in the sauce and continue to heat.for about 10 minutes. This recipe is MUCH better if you make it a day ahead and let the meatballs & sauce marinate in the refrigerator overnight! Recently I have transitioned from the ground beef to the turkey products in all of my recipes definitely due to an increase in health awareness. It hasn’t decreased any quality in the taste, and in fact, it seems to be even better. I am looking forward to making this recipe. Any information on the total number of calories in the finished product? .-= Lillie´s last blog ..Teen Credit: The good and bad that you need to know. =-.